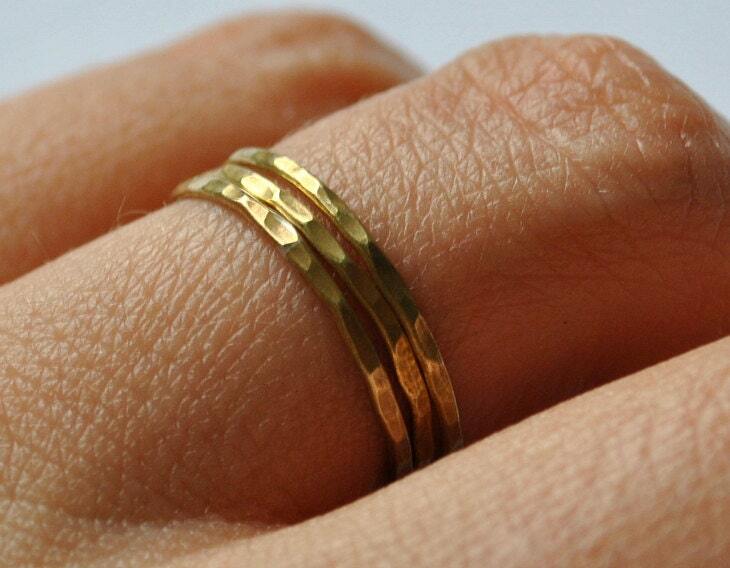 A delicate set of 3 stackable/ stacking/ stack rings, thin skinny textured bands. This set has 3 brass hammered textured bands. It is entirely hand crafted by me and it will be MADE TO ORDER for you in YOUR requested SIZE. I use 18 gauge (1 mm) brass wire. Available in any size from 4 to 12, including half and quarter sizes. If you want a set of rings with a different number of rings, juste convo me. Also pls check out all my other stack rings. All my jewelry is handcrafted by me and it is new, unworn. The rings come in a cute gift pouch which I offer for free. I ship right within 1-2 business days after receiving cleared payment through registered air mail of Turkish Post. Approximative delivery time: 4-8 days to Europe, 6-16 days to U.S.A. and Canada. If you have a problem with jewelry purchased from me, as long as the damage is not due to intentional abuse, my warranty coves the repairs. I also offer free repair of minor wear and tear. Be ready to pay the shipping both ways. hello, I would really love those rings but I see that your etsy store in no longer there?